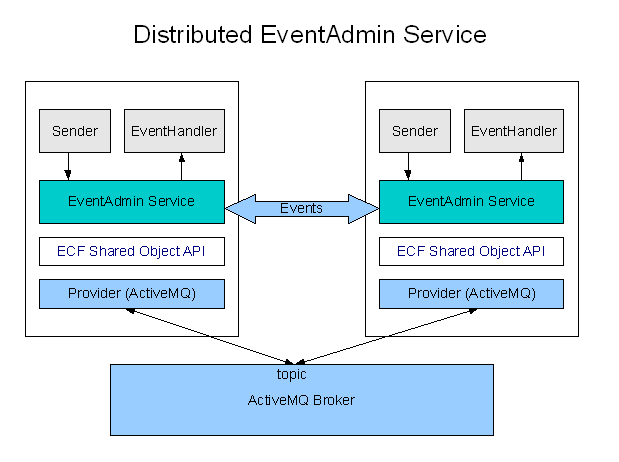 OSGi declares an EventAdmin service that is responsible for distributing events to listeners registered via the (org.osgi.service.event.EventHandler). It's possible to create distributed implementations of such services using JMS and/or other messaging frameworks for distributing messages to other OSGi frameworks. ECF's provider architecture allows the creation of a distributed EventAdmin implementation that can use a variety of wire protocols. For example, ActiveMQ/JMS 5.2 as above, or ECF generic, XMPP, JavaGroups, commercial/proprietary messaging buses, or any others that can implement the ECF Shared Object API. First, install ECF. Instructions on how to do that are on the Download page. Then get the two projects that implement the event admin example. This must be done after you have gotten the sources. How to get the sources is described in the Download Source Code. 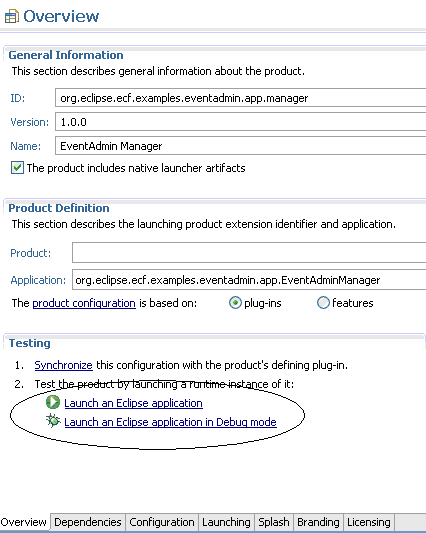 To run, click on 'Launch an Eclipse application' at the lower left. What this does is create an Event instance with values for a couple of properties (i.e. "message", and "sender"), and then call eventAdmin.postEvent(Event) to have the eventAdmin implementation deliver the message to EventHandlers. + "\n\tmessage=" + event.getProperty("message") + "\n\tsender="
You can see that the 'sender' is different for the server (i.e. ecftcp://localhost:3787/server) than for the client(s) (i.e. 9POAn/uwLgZyU5krxfjDhhhAuMU=). This indicates that both the server and the client are sending messages, and receiving them (delivered to the EventHandler's that have been registered). This page was last modified 07:24, 26 February 2011 by Wim Jongman. Based on work by Scott Lewis, Scott Lewis and Alex Blewitt.